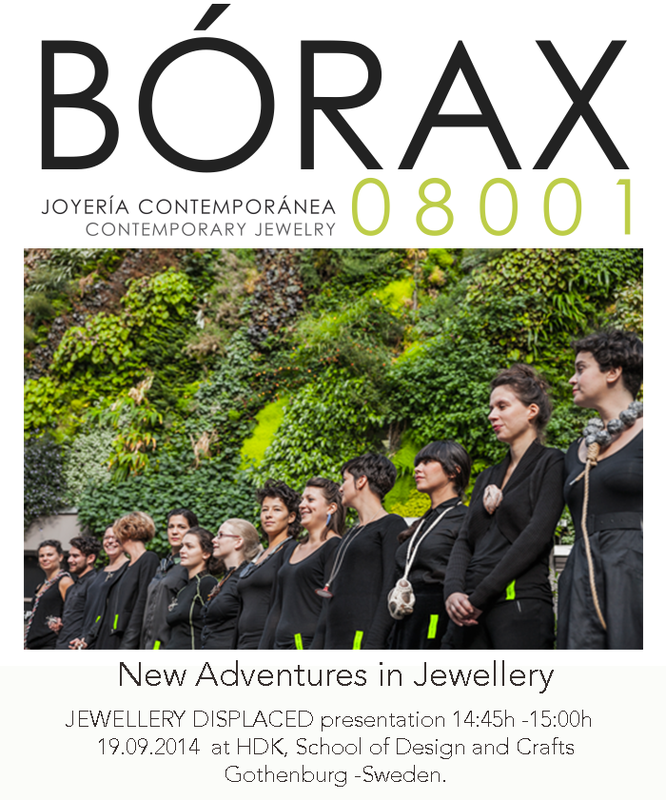 This Friday 19th of September, Bórax08001 will be talking about the project Jewellery Displaced, Paris 2013 , during the Seminar “New Adventures in Jewellery . At HDK, School of Craft and Design Gothenburg, Sweden. The lecture will be held by two of the members of the collective, Nelly Van Oost and Carolina Gimeno Carolina Gimeno . We are looking forward to see you all there at 14:45 h.
This international two-day (19-20 of September 2014) seminar marks the end of the extensive New Adventures in Jewellery events programme in and around Gothenburg and brings together some of the world’s leading voices in the contemporary jewellery world. The seminar aims to explore the way in which jewellery can benefit from adopting new working methods and engage with other fields in the arts. Furthermore, it wants to address the issue of globalisation and give example of practices and strategies in jewellery emerging from places other than the cities and schools connected to the field’s historical avant-garde. With keynote speakers coming from Europe, South and North America, Japan and New Zealand, the seminar gives insights into the current jewellery scene across the globe. The keynote lectures will be accompanied by a number of shorter presentations by speakers selected through an open call process.